The ideal beach beer just leveled up. Corona has long branded themselves as the ideal beach beer. So it only makes sense that they would embrace another notoriously beach-worthy product: weed. Needless to say, summer just leveled up. 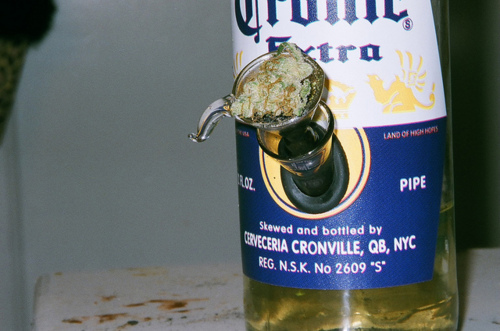 Constellation Brands, Corona’s parent company, will soon be releasing marijuana-infused drinks, which they intend to roll out in countries that have federal approval for marijuana-based products. So far, things are looking good for Canada, where legal-weed legislation slated for 2018 will make it the second country in the world with fully-legalized recreational and medicinal marijuana. Constellation’s new weed-infused beverages will undoubtedly bolster the country’s bourgeoning marijuana-tourism industry, encouraging many to visit from states where weed is still prohibited, as well as international travelers who are sure to see the country as the new Amsterdam. According to the Cannabiz Consumer Group study, 27% of beer drinkers are purchasing (or would consider purchasing) marijuana instead of beer in states where it’s legal. In order to stay competitive, Constellation signed a nearly $200 million check to acquire a 9.9 percent stake in Canopy Growth Corp, a Canadian marijuana industry giant that’s slated to officially become one of the world’s most prominent cannabis corporations once Canada rolls out its legal-weed legislation next year. Canopy Growth Corp is already available for public trading on the stock market under the name WEED. “Our company’s success is the result of our focus on identifying early-stage consumer trends, and this is another step in that direction,” said Constellation’s CEO, Rob Sands, to the Chicago Tribune. This deal will make Constellation the largest shareholder in Canopy Growth Corp, which is valued at around $2.5 billion CAD, and should only increase in value once marijuana goes officially legal in Canada. Unfortunately, though, Bruce Linton, the CEO of Canopy Growth Corp., says that these weed-infused beverages will likely not include alcohol. “There’s no need to include alcohol, nor is there an intent to include alcohol in how we follow through with things,” Linton tells the Chicago Tribune. Instead, it’s likely that consumers will simply be able to get “high” or reap the medicinal benefits of marijuana in the same way they might enjoy a beer: with a delicious beverage, rather than inhaling smoke. This might be a positive thing for adults who don’t drink alcohol, but use marijuana and don’t want to feel like the only person not sipping some sort of inebriating beverage at a party or bar. Another possibility is that Constellation will simply use terpenes—fragrant oils found in cannabis that give the plant its intoxicating aroma—to flavour beer, without giving it any of the inebriating effects associated with marijuana. Whatever ingredients the drinks combine, they’re certain to be a product unlike any others currently on the market. “We think that it’s highly likely, given what’s happened at the state level,” Sands told the Wall Street Journal. Hopefully, Sands optimism is well founded. In the meantime, once the product is officially released, marijuana and beer enthusiasts alike will have to make a trip north of the border if they want to experience the world’s first mass-marketed—and long anticipated—beer-weed combination.